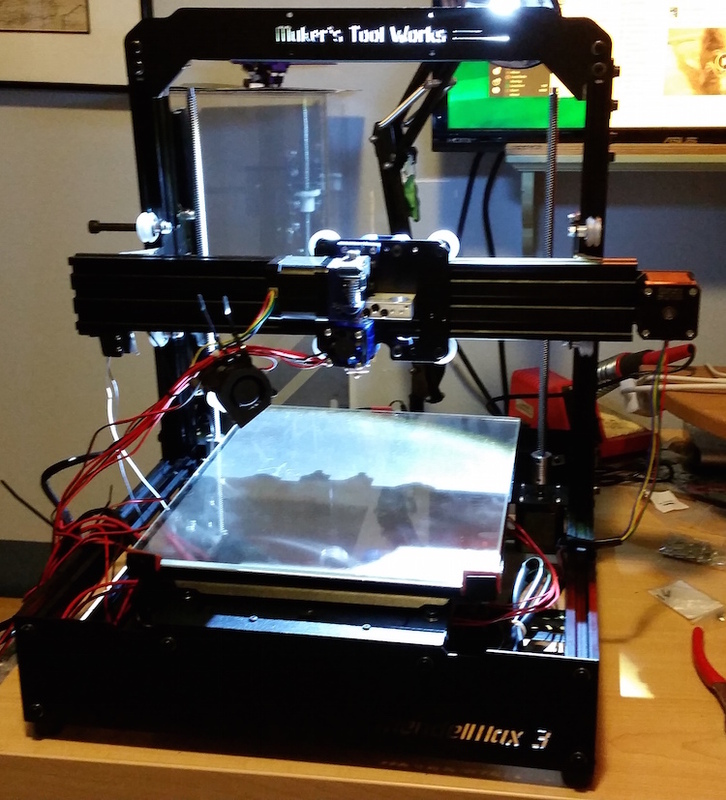 I recently gave in to the temptation to purchase a 3D printer kit, and settled on the Maker’s Tool Works MendelMax 3 as the best combination of final build quality, upgrade capacity, and potential for fun building it. Not included in that list? High quality build documentation. Which, I suppose, could be considered part of the fun. Yeah, I’m weird. So, mostly to help myself out with understanding what it is I’m doing, I’m documenting my build as I go; based on the official build guide but including my own notes and observations. This is a single-extruder, full-kit MendelMax 3. I will not attempt to include the steps specific to the upgrade process, because I have no means of doing so. You may or may not have the Y-Axis Assembly installed in your printer; if you don’t, leave it that way, if you do, think about removing it before moving on to the electronics installation (which is coming right up.) Either way, you’ll be working on the Y-Axis Assembly to install the controller hatch, which you’ll use to access the electronics once they’re installed. Slide the bed all the way back, exposing the large rectangular section of the Center Deck Plate. First, install A under the lip of the hatch opening, on the forward side using two M3-6 button head screws and a nut under the plate. The square cutout faces into the compartment. Next, install B on the opposite side of the opening, in the same fashion. The end result should be three visible tabs of plastic sticking out into the space of the hatch opening. M installs on the cover plate, on the end opposite the rectangular cutout. In also installs under the plate in the same fashion as A and B. Finally, the little printed part is… horribly difficult to photograph when yours is printed in black. But it’s shaped in profile like a question mark, has a hole in the “stem” for an M3 screw, and can’t really be mistaken for anything else. It mounts under the plate using the single hole by the rectangular opening in the hatch plate, oriented so the bottom, closed, portion of the curved segment is down inside the compartment. To install the hatch, just insert the exposed part of M between the visible tabs of B, and lower the front of the hatch into place. Gently press until the printed latch snaps into place. Done. Halfway up the angled rear 2020 extrusion on the left side, install two Post-Install T-Nuts and mount the Spool Mount Plate to them using the two holes on the flat end of the plate. Next, take the large M8 machine screw and thread one of the two nuts on to it a short ways. Slip the end of the bolt through the third hole on the Mount Plate from the outside of the printer and use the second nut to secure it, wedging the Mount Plate between the two nuts. Standard filament spools will hang nicely on the bolt. You may need a cardboard spacer to keep the turning spool from fouling on the structure of the printer. First, and most important – the electrical connections of your 3D printer are often using high voltages and currents. Don’t mess around unless you really know what you’re doing (which mostly will involve a knowledge of why you shouldn’t mess around.) Don’t work on these steps with the printer plugged in. Don’t do any of the many things you should never do around electricity. You’ve been warned. The power supply has a selectable voltage, make sure you use the right setting. In North America you almost certainly want 115, but it doesn’t hurt to check. There’s a fuse and fuse holder supplied with your kit. Snap the fuse into the hook shape on the holder, then snap it into the center port of the power plug receptacle. It has a latch and groove and only fits one way – it doesn’t require a lot of pressure, either. Snap the switch into the other receptacle. Mount this module to the IEC Mounting Plate by passing the back of the module through the frame of the plate, then pressing it against the front frame of the module. It should snap into place. You may need to gently file the plate to get the right fit. Mount the plate into the back panel of the printer in the large hole sized for it with the M3 machine screws and nuts. I found washers under the nuts made for a more secure mount. Finally, wire the three red jumpers to the three V+ terminals, and the three red/black jumpers to the three V- terminals. If you were to stop at this point and double-check that all your terminals were wired properly, connectivity was as you would expect, and there were no shorts anywhere, I’d think you were pretty smart. And if you don’t, it’s your fault. Remember that. Remember the four T-nuts per side you installed way back on Day 1? Time to use ’em. Tip the printer onto its back, or side, or put it on some sort of lift so you can get to the bottom. Install the four mounting plates across the bottom, side to side, using those eight T-nuts and the standard M5-8 and two washers. Make sure the slotted sides are “up” into the belly of the printer, and spaced pretty widely – the rear two will hold the power supply, and the front two, the electronics board. Finger-tight only until you have the spacing where you want it. The power supply mounts with four M4 screws provided in an unmarked bag… they’re flatheads, though, which helps with identification. The appropriate mounting holes in the bottom of the power supply are located well in from the corners – don’t be fooled. I found it easiest to slide the rails forward as far as the jumpers would allow, mount the power supply, then slide it back as far as I could without interfering with the jumpers themselves. This left plenty of room for installing the RAMBo board. That installs on the forward two rails using M3-16s well enough (14s would have been better, 10s were too short), with four supplied nylon spacers and hex nuts. Washers are needed between the plates and hex nuts for a secure mount. Note: the RAMBo controller and electronics are updated fairly frequently. Make sure yours matches these instructions – the paperwork included should note any changes. Attach the Y Axis Stepper connector to the Y Driver plug, again, blue towards the USB port. Attach the Z Axis Stepper connectors to the Z Driver plug and the neighboring plug. On my board the Z is printed between the two connectors – your mileage may vary. In both cases, the blue wire goes towards the USB port. Attach the Extruder Stepper connector to the E0 port. Blue to the USB port again. There are three ports, right next to the USB port on my board, labeled Z-Min, Y-Min, and X-Min. (RAMBo manufacturer – that totally needs an e-for-an-i typo.) Connect the respective endstop microswitch leads to these ports. Strip the ends of the heavy insulated wires from the hotend, insert them into a 2-pin screw terminal, and tighten the terminals down securely. Examine it closely to make sure you have a good, solid connection – low quality connections here can generate excessive heat, enough to melt the plugs. Repeat these steps with the leads from the bed heater – though in my case the ends were already stripped – and plug the connector into “Heat2 – Bed”. Cut any existing connectors from the ends of the fan wires, and strip the ends. Twist the bare red wires together, then twist the black leads together as well. Both fans go into the same screw terminal, but unlike the heater and thermistor connectors, it’s critical that red go to the + terminal and black go to the – terminal. The fans are connects to the port labeled fan0. Improper polarity here will destroy your fans. Check it again – red to +? The E3D hot ned has its own 30mm fan that must always be running while the hot end is operating. Wire it into a terminal like the others, and connect it to fan1. As with the job cooling fans – double check the polarity. Are you sure red is +? Strip and twist the ends of the six power jumpers you connected to the Power Supply earlier. Check the polarity of the large power block connector on the edge of the RAMBo board. One end should be labeled GND, on mine it’s the end in the corner of the board. Determine which terminal of your block matches that end. Then wire the six jumpers into the terminal block, starting with a red and black wire in that end, alternating red, red and black, red, red and black, red down the rest of the terminals. Then check everything over again. Plug in a power cable. Lights on the RAMBo? Power fans whirring? Congratulations, time to start configuring this thing. There’s some panels left to install. to hide the guts. Wires to route. LEDs for status and temp and so on. Uploading the firmware, configuring Repetier, going through the calibration steps. But I have a working set of printer hardware. In shipbuilding, this would be the point where somebody breaks a bottle of champagne on the bow. Tomorrow, we start fitting her out – but today, she’s floating.